Large trucks require more space than other vehicles to make turns. When a tractor-trailer moves into another lane in order to start a turn, this is called a swinging turn. Sometimes, vehicles, pedestrians or bicyclists are caught in the path of a swinging turn. The resulting truck collision typically results in very serious or fatal injuries. 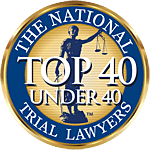 Associates and Bruce L. Scheiner, Attorneys for the Injured can help victims injured in truck collisions caused by swinging turns. Call 800-646-1210 to schedule a free consultation and learn how a Southwest Florida trucking accidents lawyer can help. The Large Truck Crash Causation Study indicates that nearly 20 percent of truck crashes result from truckers running out of their lane. Another 10.3 percent of collisions resulted from trucks side swiping vehicles that were going in the same direction and 4.6 percent from trucks side swiping vehicles going in the opposite direction. Trucks can strike another vehicle or force a car off the road when making a swinging turn. Swinging turns are likely to be dangerous not just because the truck travels out of its lane but also because cars or people to the side of the trailer may be in a truck’s blind spot. The truck driver needs to look carefully to the side before beginning a turn that could cause his truck to travel into another lane. Truck crashes caused by swinging turns are more likely to occur when a trucker is making a right turn. A driver could swing too far to the left, causing motorists to think the truck is turning left or prompting motorists to try to pass the rig. Unfortunately, when a truck then turns sharply to the right, the other vehicle can be trapped. When a swinging turn accident happens, motorists in other vehicles are more likely to be hurt or killed than the trucker. The issue is compounded by the poor performance of underride guards to the rear and lack of underride protection along the sides of most commercial trailers. The Insurance Institute for Highway Safety is among those pushing for tougher standards when it comes to underride protection. The risk of underride is highest when drivers strike guards at an angle or miss them entirely, which is most likely to occur as a trailer swings as its tractor turns. When passenger cars pass beneath a trailer, serious or deadly injury typically results. Truckers need to be aware of the risks present during swinging turns and should exercise caution to prevent collisions. If a truck driver accidentally or carelessly causes a collision with a swinging turn, the driver and the trucking company that employs him can be responsible for compensating victims for medical and financial losses. Associates and Bruce L. Scheiner, Attorneys for the Injured has handled more than 20,000 cases over four decades. Clients are provided with personalized one-on-one representation and a team of legal professionals who help victims investigate their case and prove the cause of the collision. Our Southwest Florida trucking accident lawyers can help put together a strong case that identifies all parties responsible and holds them accountable. If you or a loved one has been hurt in a truck accident, Call today at 800-646-1210 for a free consultation.